Hi.. New member here. 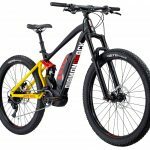 Been on the look out for an ebike for a while now, have tested several bikes/systems. Seen that Voodoo have just released there first ebikes I gave the Zobob a try.. Bosch CX drive, 500 battery, dropper post, 27.5+ tyres. £2700. Halfords had 20% of ebikes, combined with BC discount and cashback, I couldn't refuse and ended up paying about £1,850. Bike is now sat in my living room, fully charged, waiting for it's first trip out tomorrow... and I can't wait!! great first ride today done about 20 miles. mixture of roads and woods. loved the power of the Bosch motor, but was a little scared when coming to wash it. now I'm back home, I want to get back on it. 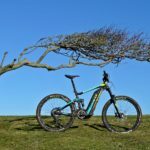 Being a mountain biker for many years who is now getting on a bit and can't quite keep up the pace these days with the dodgy old knees, so I also took the plunge and after many hours reading up on all the bikes in my budget I went for the Voodoo Zobop because of the reasonability good spec components .. Son also owns the non electric Zobop and that has prooved to be a great bike over the last 18 months on the trails, I would even say it was better than my Boardman FS pro. Love it and I took it out last Sat to do a range test. Trails, canals some steep hills and some road. I got to 44 miles and my body battery ran out, the bike was still showing 6 miles left in the battery ..
hey great to hear from another Zobop owner, glad you are enjoying the bike. I've just gone over the 100 mile mark on mine and loving it. Been up the woods tonight straight from work thrashing it about.. handles great and grips well with the plus tyres.. Surprised at how much I'm using the dropper post.. Glad it had the 500 battery.. I'm not getting the range as you, but live in a very hilly area and I'm a bit of a lump, so can't grumble.. It's on charge now, ready for tomorrow! Already own another Voodoo so agree on them being great bikes.. Please keep us on updated on how you are getting on with the bike! As you we also own another Voodoo, my son has the Voodoo Zobop non electric and that's been a great bike on the trails for the last 18 months, I'd even say its better than my Boardman FS that cost reasonably more. 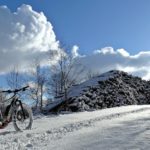 I use mine on Tour and Eco most of the time only switching to eMTB when I hit a hill that gets my puffing a bit, I think that's why I get the miles. Using it in the forest on eMTB I recon I get about 25 miles+ on it. Also Made a few additions .. Bottle cage on bars and a couple of mudguards, I found when up on the pedals I was getting a face full of crap .. Rear mudguard really helps to keep shock and battery cleaner. I was in halfords the other day and I had a quick look at them and for the money they look a fab buy and I bet halfords will sell a truck load. What size frame did you get? I have just ordered the 18" frame and I am 5ft8. I'm 6ft and have the 18" frame.. it's a brilliant bike! Just got mine back from the 6 week check-up/service..
Has anyone managed to see one of these in a shop before placing an order? I might pop in to the Cycle Republic near work and see if they can be any more helpful. Steve, thanks for giving me some hope that I might yet get to see one in a shop! Yes, there are other Halfords locally. I'll definitely give them a go if the Cycle Republic near work can't help. In theory I can get 10% off in store using a voucher that I get through my AA membership. However, I note that the voucher says "cannot be used in conjunction with any other offer". Given that the Zobop E is part of their "10% off all electric bikes over £1,500" promotion, does this mean that the voucher couldn't be used? Join British Cycling and get 10% off, a saving of £115 when you take in the membership fee. Plus you are also insured. I can't see why the voucher can't be used. I have used my 10% British cycling discount on my Boardman FS Pro last year that was discounted 10% by Halfords.